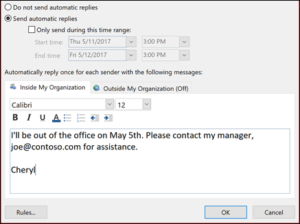 If you don’t see the Automatic Replies button, follow the steps to use rules to send an out of office message. Optionally, set a date range for your automatic replies. This will turn off automatic replies at the date and time you enter for the end time. Otherwise, you’ll need to turn off automatic replies manually. 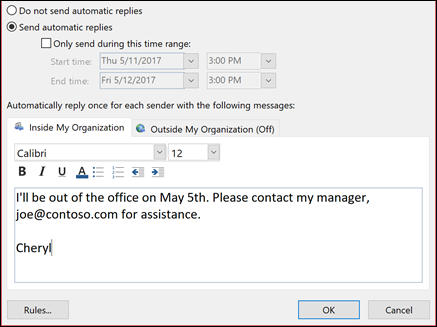 Note: If you don’t see Automatic Replies, use Rules and Alerts to set up your out-of-office message. On the Inside My Organisation tab, type the response that you want to send to teammates or colleagues while you are out of the office.